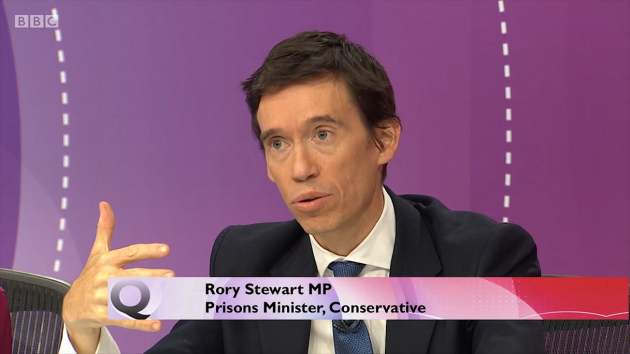 On this week’s BBC Question Time, Prisons Minister, Rory Stewart, said we couldn’t have a new ‘People’s Vote’ on the final Brexit deal because, basically, it’s too complicated for a referendum choice. So, we were asked a simple question in 2016 on whether or not we should remain a member of the European Union. But now we’re not allowed any say on the complicated answer. How democratic is that? If the terms of us leaving are too complicated to be decided by a referendum, then the same argument can be applied to the original question of whether we should remain in or leave the EU. Because the decision about our membership of the EU doesn’t involve just ’17 different components’. It involves tens of thousands of components. Mr Stewart talked of the Chequers deal as if it is a done deal. But the rest of us know that it’s a dead deal. 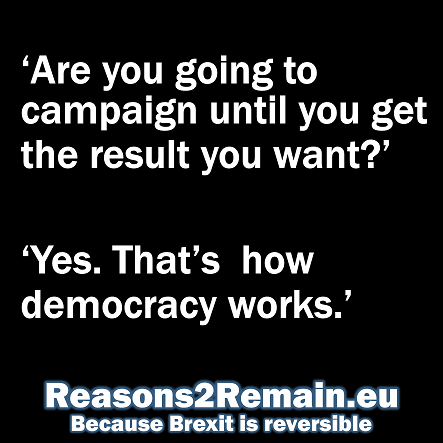 Many MPs – both Remainers and Brexiters – say they won’t vote for it. More crucially, the European Union say they won’t accept it. So what deal will we get? 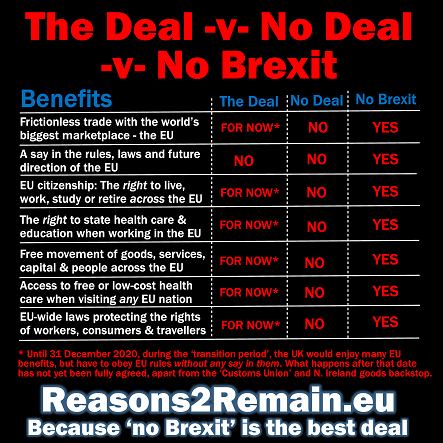 Nobody knows, but a no deal, which would be catastrophic for all our lives, is increasingly looking likely. We must have a democratic say on this. It’s vital. The problem is that binary choices don’t work. Not in our own lives, and not in politics. Do you say a simple yes or no to a holiday? No, you also need to know where you’re going, when, and how much. Do you say a simple yes or no to a new job? No, you also need to know what the job entails, the salary, and the conditions of employment. 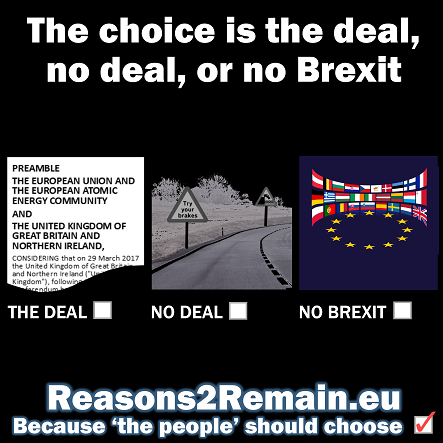 When we know the actual final details of the Brexit deal or no deal, the electorate needs to have a say on it. It’s no good giving us a yes or no choice to a complicated question, and then telling us we can’t have any say on the detailed answer. 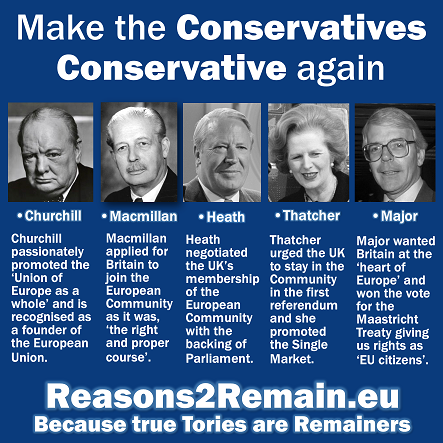 We need another referendum, or another snap general election. We cannot allow incompetent government ministers to decide the future of this country, and all our lives, without any further input from us, the people. Most of us can now see the exact opposite: leaving the European Union will tear this country apart for the next 50 years. Give us a say on our future. That’s democratic. The government’s view is that they can go ahead and decide our future for us, without any say by us. That’s not democratic. That’s dictatorship. 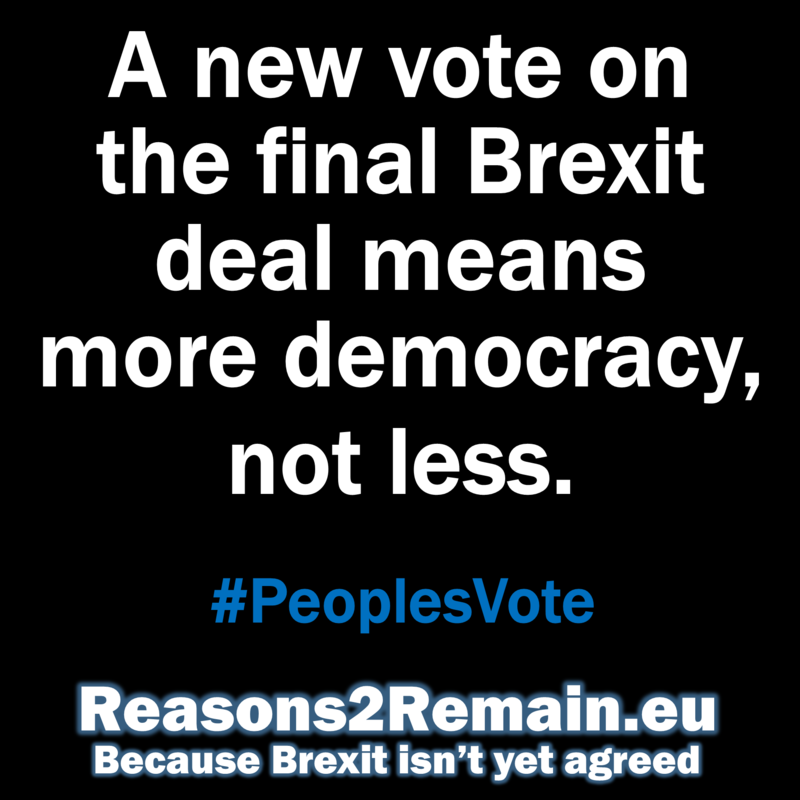 This entry was posted in Current Affairs, Democracy & Citizenship, Politics & Public Policy, The EU and tagged BBC Question Time, brexit, Chequers Deal, David Dimbleby, European Union, People's vote, Rory Stewart. Bookmark the permalink.